We are looking into getting hoodies made for the winter. Also, anyone that wants a shirt from Canada, please PM me your info so I can get you a shipping quote. We want everyone to be able to wear our t-shirts no matter where they are. After you place your order for the t-shirt simply email us at CS@DetroitMotorApparel.com with your choice from Honda Heart, I heart My Honda, Pedo Bear, or JDM Panda while supplies last! Thank you everyone for all of your feedback and help. We truely appreciate it. First off, I am sorry, I know this is in the wrong section but I cannot get an admin to contact me back about my account being messed up. If you have any comments or concerns please comment! We love to hear feedback, good or bad. Thanks for all the support. Right now you can go on our store and buy the Prelude classic shirt for pre-order and get the free shipping and free decal. Each shirt would be $20.00 shipped. ALL FEEDBACK, COMMENTS OR CONCERNS ARE WELCOME. Please tell us what you think. Last edited by DetroitMotorApparel; 08-01-2010 at 04:25 AM. Indeed! As long as they are quality, I will take a 4G! BB2 FTMFW!!! I will be really disappointed if the screen printing is less than desirable though.. What brand shirt is being used and what quality would you rate the priniting (1-10)? ill take a bb2 black 4th gen shirt. Any chance to ship a classic in medium to Canada? Super pleaseee? Ehhh I REALLY like the classic one. If I hadn't just popped out $20 last month for a lude shirt I'd be all over it. What are the chances this group buy might come back around in the winter with a hoodie or something? I'd be sooo down for that. wheres the bigger pics of the shirt? why does it have a 4g as 1993? and then a 5g as 2001? Also, these shirts are made with Anvil Premium Fashion Fit T-Shirts. They are 4.3 oz, soft, and have a tear away tag for extra comfort. The screen printing is top notch. This is not some shirt we print out of a basement. PRELUDE CLASSIC SHIRTS ARE NOW AVAILABLE FOR PRE-ORDER. 6 people from Prelude Zone have already ordered there's so don't wait or the free decals will run out. change the dates on the shirt, it's wrong. read post above yours. I'll urge everyone to NOT buy one unless you fix it. its h22. h22's didnt come in 4th gens till 93... So even though 4th gens were out in 92, this is correct, however, i agree in that it should say 92. Thanks everyone for your input however we wouldn't really want to be looked at like we didn't know what we are talking about. This shirt is an H22 t-shirt, a VTEC motor. 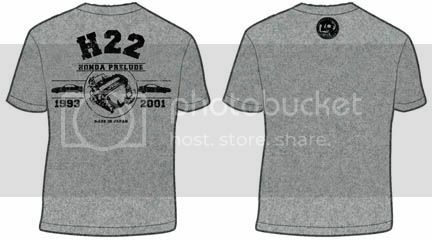 Although the fourth gen was introduced in 1992, we are making an H22 t-shirt, not just prelude. The H22 was first put into the fourth gen in 1993. We understand why you may have been confused though, sorry about that. However please be respectful instead of telling people not to purchase the shirt. Thanks everyone! Last edited by DetroitMotorApparel; 08-02-2010 at 07:30 PM. confused? I'm not confused. and be respectful? you're hocking your crap on our forum, not the other way around. why would you offer only one shirt that excludes ~50% of the members on the site? We apologize to those who were offended by the T-Shirt. We want to thank the MANY people that have purchased the shirt. If you have any negative comments or concerns we would appreciate that you PM them to us instead of creating a negative environment on the forum. The reason we made the H22 t-shirt is because between this Prelude Forum and the others, we had a large amount of people wanting this one. We did offer 3 different Prelude shirts in the beginning and this was the shirt with the most votes to make. Thanks again to everyone for the support and feedback. We will absolutely look into that for the future. Thanks for your comments! THESE SHIRTS ARE SELLING VERY VERY FAST. If you were interested in getting one, pre-order it on our site and receive free shipping and a free decal while supplies last. Decals will be selected at random, but from the Honda set of decals. Last edited by DetroitMotorApparel; 08-03-2010 at 12:12 PM. DMA, you have a pm from me. We are now shipping to Canada and the UK! Shipping to Canada will be included in the free shipping for a limited time so order soon! Thanks everyone. Last edited by DetroitMotorApparel; 08-03-2010 at 09:10 PM. Anyone else? We are now shipping to Canada, UK, and Netherlands! The shirts are almost gone! Make you to get yours while their still here. New Shirts have also been added. We have made a whole another batch of all of the prelude t-shirts. There is also a sale going on right now! Use coupon code DMA10 at check out for a discount. All shirts are under $16.00 and hoodies under $30.00. All T-Shirts are 13.99 on sale now! New stock of all Honda t-shirts. Check it out!